If you are looking for large family meal planning ideas, you’ve come to the right place! I am cooking each week for 8 people. We have two grown ups, a teen, two pre-teens, an eight year old, a three year old and an eighteen month old. I love online grocery shopping at Walmart and sending the teen to pick it up. I love my slow cooker and the pressure cooker. And I love to do freezer cooking. It saves my sanity and helps me get dinner on the table. Our life is busy- we homeschool and run businesses from home. Dinnertime needs to go as smooth as possible at my house. Here is what I am feeding, and have fed, my family this week. Sorry it’s the end of the week that I am sharing this…. it’s been a crazy busy week. I generally like to share this on Sunday or Monday. BBQ Sliders– these were are so delicious. This is a meal from our January 2018 Freezer Meal Plan kit. Some of the ladies who made these after doing the assembly said they did not add the purple onions. My family did not love the onions so next time I will either chop them down more or omit them. (I love onions…. but I am pretty much alone when it comes to onions at our house). I made sweet potato fries and crinkle cut fries to go along with these. Super easy! Baked Ziti– this is another meal from our January Freezer Meal Plan. It was so good! I served it with a dinner salad and garlic bread. I love these disposable deep dish aluminum pans for freezing. Orange Ginger Peach Chicken– this is a delicious meal that can be done one of three different ways. I cooked it in the slow cooker this time for 6 hours on high. Honestly 5 hours was enough. If thawed you could cook it in the pressure cooker for 15 minutes- do add about a cup of chicken broth. The pressure cooker requires at least 1 cup of liquid and this recipe has limited liquid in it. The other option would be to cook this in the oven at 350 for 30-45 minutes or until juices run clear. Here is my process of thawing, slow cooking it and plating it up for my family. I served this with brown rice (made in the pressure cooker) and broccoli I steamed on the stove. This was on the meal plan last week, but we switched it out for this Chicken and Peppers because we had everything on hand for either one. Baked Frito Pie– using leftover chili from earlier in the month that is in the freezer. Corn Black Bean Chicken Salsa– this is also from our freezer meal assembly last weekend and it makes a lot! We shredded the chicken and made it into tacos. I love these flour tortillas. Chicken Enchilada Soup– using the leftover corn black bean chicken salsa as a base. Leftovers– whatever is leftover we will do something with it. 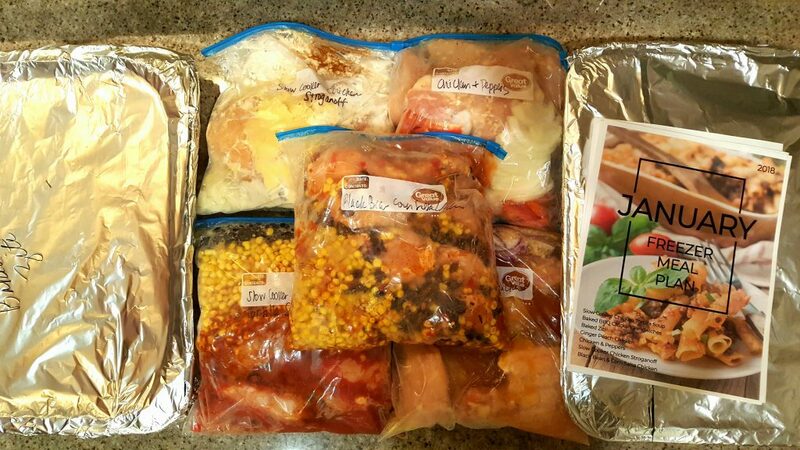 Here is what our freezer meals looked like. If you have not tried freezer meal cooking, you are missing out. Now is the perfect time to give it a try. It will take so much stress off you’re shoulders. Trust me. Here is how to get started with freezer meal cooking. You can watch our meal assembly video here and you can grab the January pack here.